Just watched a re-run of a film on TV. Whilst it had nothing to do with ships or the sea there were however a couple of scenes shot on the bridge of a ship with a follow-on of the ship alongside in New York. On closer inspection ( I rewound the film to the relevant parts.. sad ) . The ship in question is clearly QE2 berthed at the Manhattan Terminal, her name was changed to Queen Helena. There is a good close-up of the bow and name as well as the bridge and forward superstructure. There is also a very quick view of the funnel top. Intriguingly there is a large dent on the bow close to where the centre anchor plate is. Rewinding a little further and looking at the bridge shots (I never managed to to get on the bridge so can't be certain it is QE2's) there is a large deckplan image on one of the walls. Looking at it very closely the colour scheme is remarkably like that used in Cunard brochures of the time. 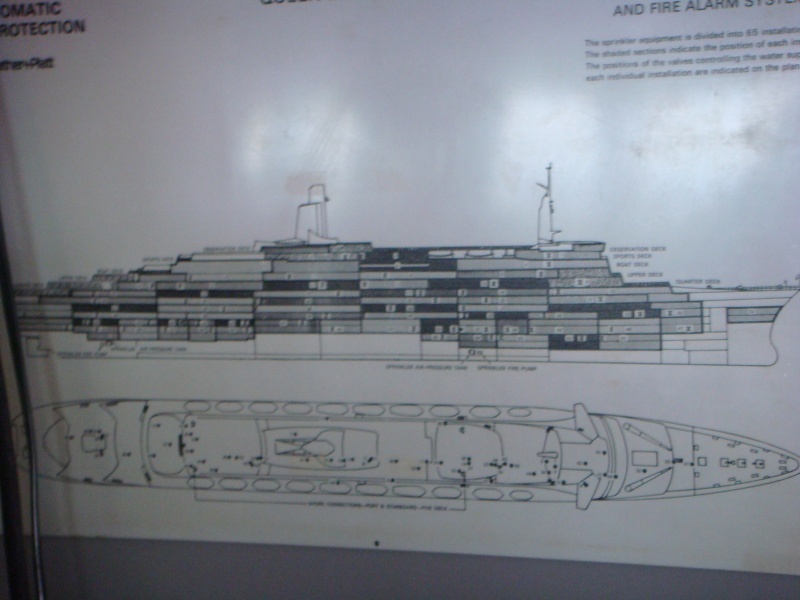 There is also a side elevation image of the ship again keeping with the Cunard theme, but the image has two QE2 funnels! As a result I thought it would be useful to kick-off a thread to capture any other appearances of QE2 in movies, either as herself or as an assumed name. QE2 was featured in 2 TV programs originally broadcast in 1979/80: "Brideshead Revisited" (a miniseries based on Evelyn Waugh's novel) and a National Geographic Special titled "The Superliners: Twilight of an Era". Most of the National Geographic special was filmed on board in July 1979 but they came back later in the year to do some more interviews on the Westboound crossing of Oct 22 to 27. On that same October voyage, the "Brideshead Revisited" scenes were filmed. I was aboard on that October boyage and the producers of both features were looking for passengers to volunteer as extras or for interviews. I declined. And Hyacinthe Bucket (pronounced "Bouquet") did a cruise on QE2 on an episode of "Keeping Up Appearnces"
I don't recall what name was used for the dhip in "Brideshead Revisited", but QE2 was called QE2 in all of the others. Brian_O wrote: I don't recall what name was used for the dhip in "Brideshead Revisited", but QE2 was called QE2 in all of the others. I suspect she was playing one of her older sisters either Queen Mary or Queen Elizabeth. CAP wrote: Just watched a re-run of a film on TV. Whilst it had nothing to do with ships or the sea there were however a couple of scenes shot on the bridge of a ship with a follow-on of the ship alongside in New York. On closer inspection ( I rewound the film to the relevant parts.. sad ) . The ship in question is clearly QE2 berthed at the Manhattan Terminal, her name was changed to Queen Helena. There is a good close-up of the bow and name as well as the bridge and forward superstructure. There is also a very quick view of the funnel top. Intriguingly there is a large dent on the bow close to where the centre anchor plate is. Was this the deckplan image you see in the movie? If so, it is one displayed on the bridge of QE2. I was lucky enough to get there during a crossing in April of '08. One of the great thrills of my life, standing on the port bridge wing watching the ship slice her way through the North Atlantic. Exhilarating to say the least. CAP wrote: Was this the deckplan image you see in the movie? If so, it is one displayed on the bridge of QE2. I was lucky enough to get there during a crossing in April of '08. One of the great thrills of my life, standing on the port bridge wing watching the ship slice her way through the North Atlantic. Exhilarating to say the least. No this wasn't it, the one shown was a colour representation, well shades of red anyway. That said it is interesting to see that the image you posted actually shows the ship in her original build configuration! That is interesting about it showing the original configuration. I had not looked at the image that closely, and at the time I was just photographing everything I could during the limited amount of time I had on the bridge. It was (probably still is) displayed on the bulkhead on the bridge. That photo was taken in April 2008. While on the bridge I never saw the image you mentioned showing QE2 with 2 funnels, so I don't know where that came from. I have posted more pictures taken of the bridge elsewhere on this site. I haven't seen "Brideshead Revisited", but a search turned up this tidbit from the Internet Movie Database site (imdb.com) under "Filming locations for Brideshead Revisited".